I live in Center City now and grew up in Philadelphia so I just love how quick a trip to the Shore is. I especially love Stone Harbor, it’s such a beautiful and quaint town. When I was in college, I worked for Red Bull—not a lot of people know that—and we traveled to the Shore all the time—Avalon, Ocean City, pretty much all the towns. That was probably the most fun job I’ve ever had, besides being a journalist in my hometown, of course. It really is a privilege to be welcomed into people’s homes every day so when you meet viewers out in the community, it’s like they already know you. It’s very special. I love all the music festivals of the summer like the Roots Picnic, July 4th and Made in America. Philly comes alive in the summer. I will also be traveling to the Dominican Republic and finalizing another trip. I try to travel as much as I can, preferably somewhere with a great beach. I love Sea Isle City and Carmen’s for crabs. I love The Wharf in Wildwood, too. And I love attempting to surf in Margate and I’m a big paddle boarder so paddle surfing is my favorite right now. I get access to people and places I wouldn’t have otherwise. I was just with Diddy and Fergie in New York City. Who can say that? I’ve been to Rio and the Cannes Film Festival. And nothing beats the experience of being in a Target and someone gives me a hug because I love people. Fergie. Your Grandma. I love everyone! I’m half J. Lo, half Mrs. Doubtfire. I’m either all glitter or pure sweatpants. There are so many things about my job that are amazing it’s hard to pick just one. I love telling stories and I’m encouraged by the fact that there are positive stories of triumph, perseverance and success out there that we all can learn from. Even in the midst of some difficult news that we have to report, it’s those stories of hope and change that really keep me going. I can’t wait to spend some good quality time this summer with the family at the beach. I also have a milestone birthday coming up. It’s funny, I’m actually pretty excited about joining the 40 club. It’s been two years since his death, but Prince is always in heavy rotation. Growing up in Las Vegas, we often traveled from the desert to the beaches of California and Hawaii. Now in my seventh summer of going from city living to down the Shore in an hour, nothing compares. South Jersey has the best of everything and if you’re reading this, well, you already knew that. Stone Harbor is the undisputed champ for my family. Seven Mile Pies, Springer’s, Shore Juice and Water Star Grille have long fueled our days. I also love the charm of Cape May and the farmers markets along the Shore are pure gold. Each town has such a distinct personality which makes each uniquely attractive. My goal is to divide and conquer this summer and experience it all. I’m most excited about NBA free agency with the Sixers now considered a top destination. 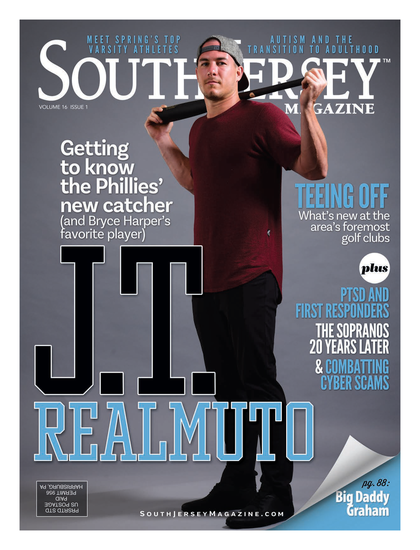 Click to view South Jersey Magazine featured on CBS Philly.